Tranquil Filz Baffle is a suspended panel oriented perpendicular to the ceiling to optimize sound absorption. 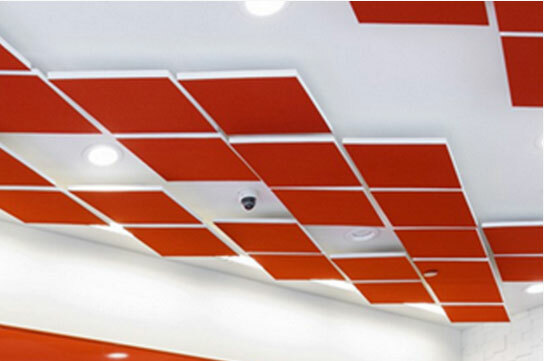 This smart acoustic solution creates subtle patterning across the ceiling in 63 colors and provides almost 1.00 Noise Reduction Coefficient (NRC) rating. Maintenance: Vacuum occasionally to remove general air-borne debris. Should soiling occur, clean with a mild, water-free dry cleaning solvent. Lead Time: Baffles are made to order and certain lead times will apply. 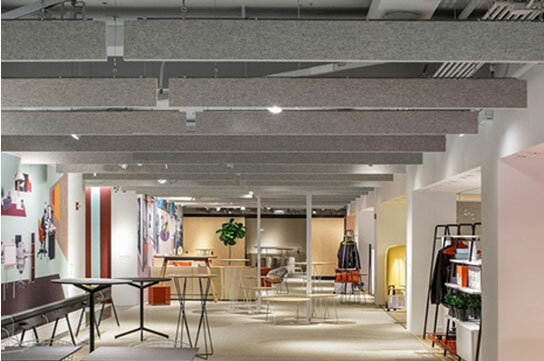 Environmental: Wool felt is 100% biodegradable and acoustic substrate is 100% recyclable. Filz contains no formaldehyde, 100% VOC free, no chemical irritants, free of harmful substances. Variation: Wool felt is a natural material and minor changes and slight inclusions of natural fiber on the surface are evidence of the 100% natural origin of the material. The natural colorways are undyed wool and color variation may be more pronounced beyond normal commercial range. TRANQUIL FILZ CLOUDS is a collection of acoustic solutions that effectively (and beautifully) abate sound reverberation. Available in almost 63 colors, TRANQUIL FILZ CLOUDS is Suspended with standard suspension hardware that allows for easy installation. Lead Time: Clouds Baffles are made to order and certain lead times will apply. 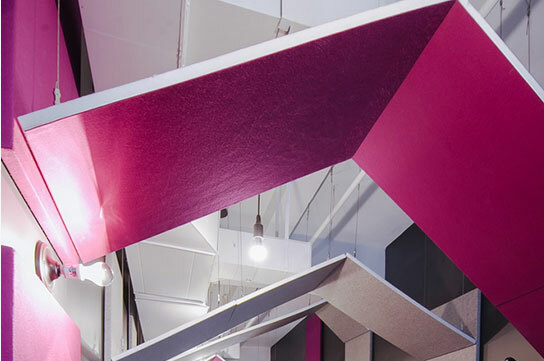 FOLDING CLOUD offers a surface-mounted acoustic solution that can softly fade into the background or create an unexpected pop of color and texture. Tranquil Folding Cloud with the Interlock Mounting System that allows for a quick and easy installation, even in an occupied space. Lead Time: Folding Cloud are made to order and certain lead times will apply.